Villa San Cristobel is a huge five bedroom villa sleeping up to ten. Set amongst tranquil olive groves within the Sierra Martilla mountains, you are just 45 minutes from Granada city and airport with many international flights, with panoramic views down to the lake at Iznajar, and just one hour from an idyllic beach. Painstakingly refurbished, and lovingly transformed into a luxurious holiday home with fenced private pool with a child lock, the villa is set in its own landscaped gardens and was once the village school. The property has free broadband wifi and plenty of games, a Table Tennis Table, DVDs, baby and child equipment and separate seating areas, making it perfect for families or large groups. With many pieces of original art, it is a truly special holiday home. Situated in the Andalucian olive belt, it's a perfect base for trips out to the coast, the Sierra Nevada mountains, Cordoba, Seville, and Granada with its Alhambra Palace. Alternatively you can lounge by the pool or visit one of the local villages for a leisurely home cooked lunch or tapas. Our guests usually end the days eating, and chatting out on the huge terrace, watching the sun go down over the lake. The Lake at Iznajar is the largest in Andalucia. It's nearby beach provides a wonderful place to lay in the sun and swim. You can also camp here, fish for trout, catfish and bass or try some of the water sports during summer like canoeing or boating. The area is crisscrossed with amazing hiking trails that will allow you to observe Andalucian flora and fauna up close. We can always point you in the right direction. As your hosts, we are usually in hand to help you with anything. Whether that is picking the best places to eat, places to see or just having a chat and letting you know about the area. We have had happy guests for over 10 years now, so nothing is too much trouble when you on holiday with us. Nik, Jacqui, Rosie and George left the UK in 2003 to start their new life in Andalucia. Having lived around the world and stayed in the best and the worst the world had to offer, we think we know what people want from a holiday. We bought this old Spanish farm house, Casa Caballos and then later illa San Cristobel because we love everything about this part of Spain. The food, the people, the architecture and just about everything here that makes you feel that you are alive! We live here full time and are committed to our life here and providing a memorable holiday for you. With over 10 years experience, we think we have cracked it! Villa San Cristobel is located in Puerto Blanquillo or White Haven, a small hamlet nestled in the Sierra Martilla, at the heart of Granada's olive growing region. Just an hour's drive from the coast, airport and Granada. The nearest villages; Zagra and Ventorres de San Jose, both retain a peaceful, traditional Andalucian way of life that is quickly disappearing on the coast and in many of the well visited Pueblo Blancos or 'White Villages' elsewhere. None of the Bars or Restaurants will appear in the Zagat or Michelin guides, however armed with a few Spanish words and a phrase book you will be welcomed by the friendly patrons and locals. En-suite bathroom shower. Family bathroom bath / shower. Downstairs bathroom with WC. Huge lounge with seating for 10 on sofas and armchairs. Large screen TV, DVD, Sky satellite. Large French doors leading to covered terrace, dining terrace and steps to pool area. Fully fitted kitchen with dishwasher, hob, oven, microwave, granite work surfaces. Breakfast bar. Skiing at the Sierra Nevada. Notes on accommodation: If traveling with children rest assured that our home is child friendly. We know difficult it traveling with children and more importantly their stuff! That's why you can leave it at home as we provide: Many baby and child toys, on request sterilizers, baby monitor, cots, baby backpack, changing mat, bath and high chairs. There's also kids games and puzzles for the rest of the family. When renting in summer months the spacious interior has marble floors throughout and high ceilings to keep you cool. For the winter there is central heating and double glazing to keep you warm as toast. 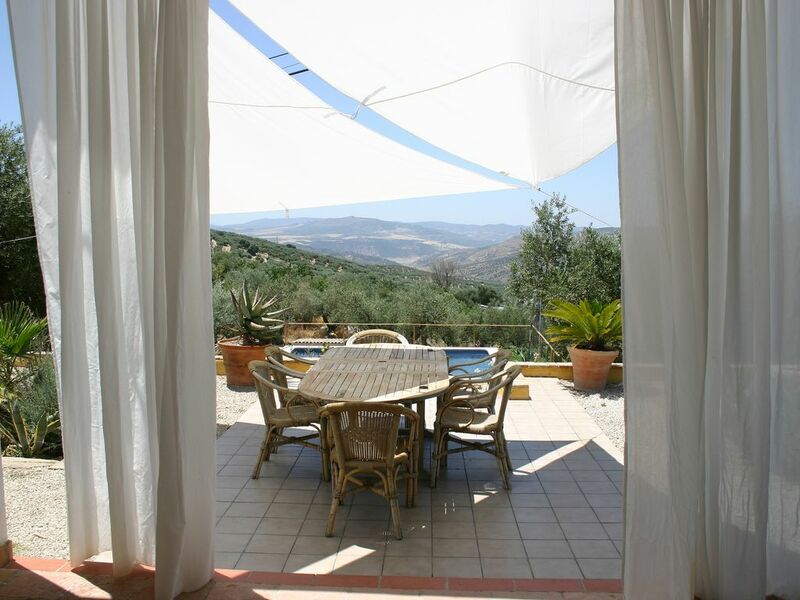 Outside: The villa is surrounded by olive groves and farmland. The house has a Landscaped garden, swing ball, BBQ. If you need to cool off, walk down through the landscaped gardens and dive into the beautiful new pool or relax on one of the many terraces and enjoy unrivalled views down the valley to where Malaga, Cordoba and Granada meet. Utility Room: Washing machine and central heating boiler. Cleaning / Towels / Linen / Maid service: Towels and linen provided. Pool Towels also provided. Other: Dining room with large dining table, leading through to kitchen. Amazing location, beautiful house. Will be back! We loved our stay at the Villa. From the time we arrived (with the very generous welcome pack) to Nik helping us with arranging extra beds, we couldn´t have felt more at home. Set in its own rural location looking down to lake, we spent most days just hanging out around the beautiful pool. The house has very well equipped and we had everything we needed. Nik was very helpful with things to see and do and nothing was too much trouble for him. We are already planning our next trip! What a beautiful place! We stayed here with a group of friends and had an amazing time. This felt like so much more than a holiday home, it's a perfect place to get away from it all whilst still having all home comforts, a pool and stunning views, I could spend hours just sitting on the terrace, in fact I did!! A short drive from a village with a traditional rustic andalusian feel, and some good tapas so you're not completely in the sticks. We also had a great day trip to Granada from here and visited the local dolmens. We would definitely recommend. Property was clean and the owners helpful in all communications. Thanks Louise so much for review. Hope to see you again soon. We stayed for one glorious week at Niks villa. It was faultless from the booking process to arrival. We did arrive very late but to be greeted by this beautiful villa and home comforts made us feel relaxed to begin our weeks holiday. The villa is home from home and has everything and more we needed. We had planned to visit a few local areas, but because of how well relaxed and the awesome Spanish weather was we spent a week chilling by the pool and enjoying Spanish sunsets along with one or two tintos. We will definitely be back, thank you Nik. We were an extended family staying with 6 adults and 4 children from 0 - 70 years old. The Villa was spotlessness clean when we arrived and the owners had left food and essentials for us as we arrived very late at night. A lovely touch! There was plenty of space to find a secluded corner away from each other if needed and the views are to die for and we enjoyed watching the sunset from the terraces. Our favourite thing was the fab secluded pool among the olives groves and swimming at night with the pool lights on. The pool is gated, so no worrying about the children and there was loads of room for them to play. We had a fantastic stay in the villa- and for me it was the perfect combination of modern and rustic style with loads of special touches.We really loved the original art work! It was great to have all the mod cons to make the holiday go smoothly, wifi etc...but still have such a unique,tranquil setting. We really loved the location and managed to get to Granada and Cordoba with no problems.The owner's local knowledge was vast and helped us make the most of the local fiestas and sights- of which there are too many to mention Loved our stay i wouldn't hesitate to recommend it! Thank you Nick and Jackie for a wonderful stay! Our family of six adults and four children (two 5-year olds and two 1-year olds) had wonderful time in this isolated rural villa situated among the olive groves. The accommodation was very comfortable and as described by the owner except that the third bathroom has no shower. There was plenty of space and lots of toys to amuse the children. The pool was beautifully clean and well-maintained. 1. The garden is getting overgrown and needs some attention e.g. the large prickly Agave specimens are beautiful but not very safe for children and there is now little space outside for them to run around. 2. The house was superficially clean but would benefit from a deep clean sometime soon. 3. The equipment around the pool was looking a bit tired and some of the garden furniture was broken. Unfortunately, the local farming community relies heavily on tethered dogs to protect their property. They tended to be quite vociferous at night time. In spite of these quibbles we had a wonderful time at the villa. Malaga is just over an hour away. Granada 45 mins. Villages 1- 3km away. Outside Bar by waterfall - 1 km away. Lakeside beach and restaurants - 25km away. Costa Tropical - 1 hour away. 5 minutes to the nearest villages and 20 minutes to Loja, a major town. Nearby villages Ventorres de San Jose and Zagra boast many bars and fiestas, banks, doctors and convenience shops.